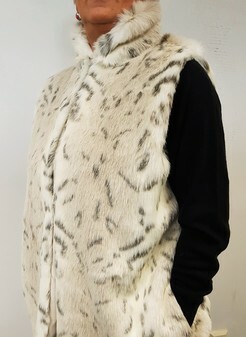 Long Faux Fur Gilets. Perfect for women on the go, slip into one of our luscious, super soft Long Gilets. Fun and Fabulous Glamour for winter. With a stand up Peter Pan Collar, 2 pockets and 2 faux fur closures, our long Gilets measure 72 cm (approx 28”) excluding the collar and are lined in Cuddles Soft Velboa for extra warmth.